Shirts With Random Triangles: La. Tech head coach Skip Holtz defends Jeff Driskel, says QB was scapegoated at Florida. "I think down at Florida, it got very toxic for him. He became the scapegoat," Holtz said. "He became the guy that was tied to losing at Florida as a fan base that does not take very well to losing. It really became a negative situation, which is unfortunate because he's such a great Christian young man with such great values who is a leader. "If you ever have a chance to sit down and talk with him, he's almost too good to be true. He's exactly the way you'd want to raise your son. I'm really proud of him and really happy for him that he was able to go out, play that way. Our fan base was able to embrace him the way that they did." 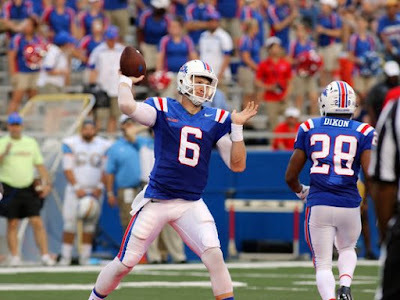 Driskel, a graduate transfer, went 12-for-15 for 274 yards in his first game with La. Tech last Saturday. He threw four touchdowns, and ran for another in the Bulldogs' 62-15 win over Southern.